Hello everyone!! I hope your having a great day! Today's prompt is gradient. I follow the lovely Special Girl Nails and she did a beautiful gradient down the middle of her nail and I had to look at it! I wanted to keep it simple or as simple as I could other than the gradient. My gradient is no where near as perfect as hers but I plan to work on this and revisit this design again. I have to get closer to the perfection of her mani! I will also matte this next time! I ran out of time and wanted to take this polish off. I had it on for three days before I did the gradient which is some sort of record for me. I want to do it with black and white for sure. 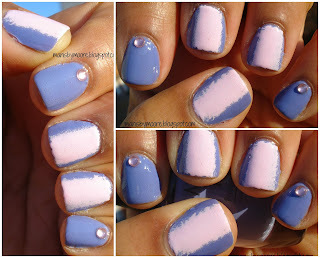 Have you tried this type of gradient?? Any tips to keep the gradient in the middle thinner?? Thanks for stopping by!